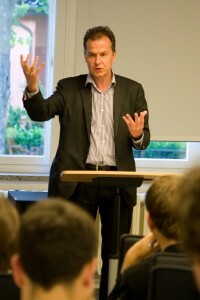 On Tuesday the 29th May, Thomas Schmidt visited ECLA to give a lecture entitled “Why Lying is Wrong (When it is Wrong)”. Schmidt, who teaches at Humboldt Universität zu Berlin’s Department of Practical Philosophy and Normative Ethics, is regarded as one of Germany’s most important writers in his field. Thomas Schmidt began by defining exactly what lying is, and I would be lying if I were to tell you that it was an easy task. Or would I? Well, apparently I’d only be lying if I were making an assertion to you which I believed to be false in order to convince you of its truth. I wouldn’t be lying, however, if you simply overheard me lying to your friend—for you are only being lied to if you are the intended addressee of the lie. Interestingly, though, it would not stop being a lie even if I accidentally told you something true. Apparently, as long as I believe it to be untrue, it is a lie irrespective of whether it is in reality true or false. We then looked at some theories that philosophers have traditionally put forward as to why lying is wrong. Schmidt dismissed the assertion that lying is wrong because it contains some kind of inherent logical conflict with the way language is intended to be used. He also, very interestingly, claimed that lies that have terrible consequences are not wrong because they have terrible consequences. The consequences may indeed be terrible—for example a lie leading to a nuclear explosion—and yet, once the bomb has exploded, it is the explosion itself that we find to be the truly morally abhorrent event, with the lie just being an interesting related matter-of-fact. By the same logic, Thomas Schmidt ruled out any other consequences or facts related to lying—for example, intent to deceive—as the features that make them bad. What Thomas Schmidt was attempting to look for was what makes lies wrong in themselves. He came to the conclusion that, disappointingly, we don’t quite know what it is that makes lies wrong apart from the very fact that they’re lies. After going through the process of showing that it isn’t any of the above related or conditional elements of lying that make lying inherently bad, all we are left with is the lie itself. In this way, it seems that when we say ‘lying is bad,’ what we’re actually saying is something like ‘lying….yuck!’ We don’t know quite what we don’t like about them, but we realise that it’s something in the lie itself rather than its consequences or conditions. Some of the students in the lecture hall seemed unsatisfied with this answer. After having taken courses in meta-ethics over the last few terms, some were keen to understand how ‘lies…yuck’ could be a solid justification for condemning lying without identifying some inherent wrongness. Thomas Schmidt, however, said that he had attempted to offer an explanation as to the ‘wrongness’ of lying whilst remaining ‘meta-ethically neutral.’ That is, without exploring a metaphysical theory of what it ‘badness’ ultimately is. This was an interesting, and for some frustrating, exercise in analytical philosophy.